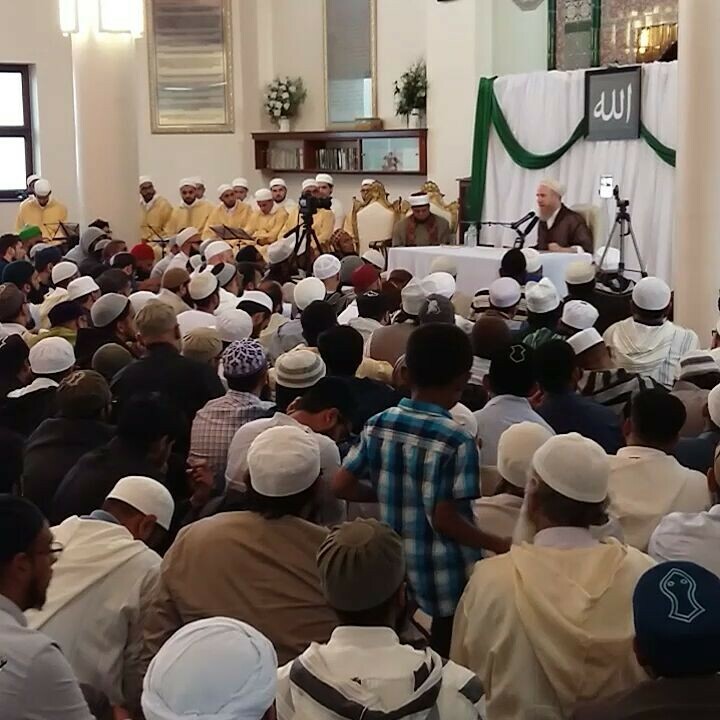 On Saturday 20th August, Shaykh Muhammad al-Yaqoubi addressed a packed crowd in Manchester Central Mosque, with the first of four talks presented by Sacred Knowledge, entitled The State of Muslims Today: Problems & Solutions. 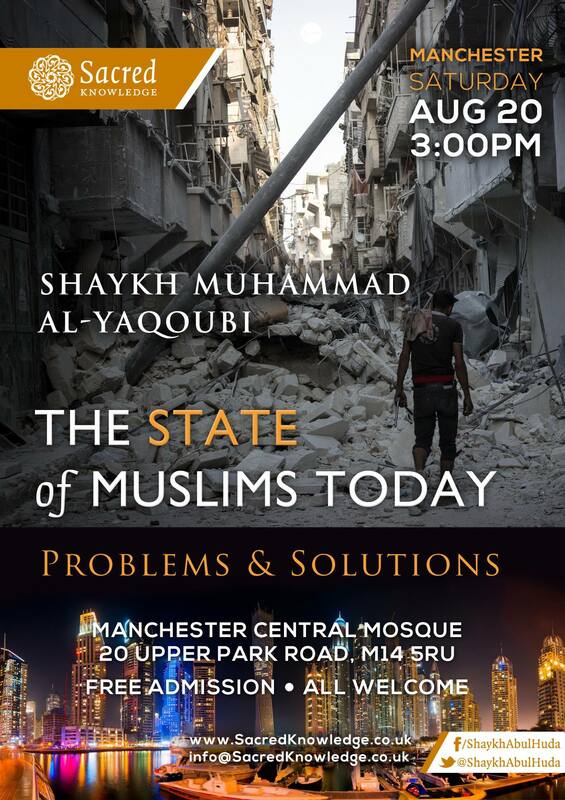 Perhaps counter-intuitively, this talk was not addressing the political situation and theological challenges the Ummah faces today, but was framed within a more affecting, and affectable, context, namely, our spiritual state(s). 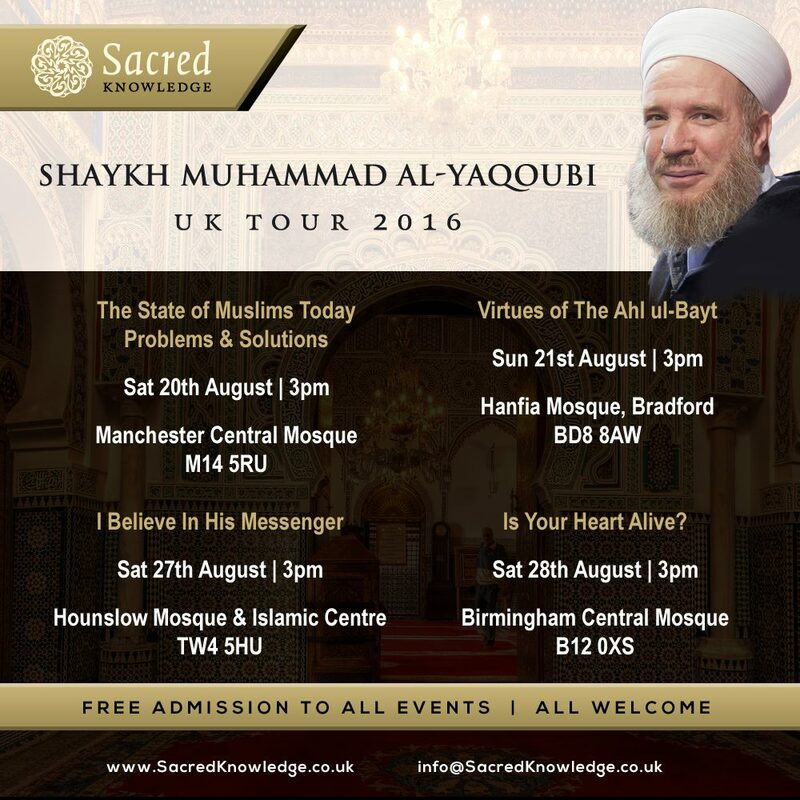 Shaykh Muhammad explained the link between the themes of all four talks in the tour, namely, the problems facing the Ummah from the perspective of the lack of respect for the Ahl al-Bayt, the diminished (or neglected) respect for Sayyiduna Rasul’Allah – sallallahu alayhi wassalam – and hearts which need enlivening. He then briefly acknowledged the suffering we face, noting that it is commonly part of the lived experience of a Muslim’s life, yet, theologically, we recognise such suffering as temporal. The challenge many Muslims face however, is that instead of manifesting a state of forbearance [sabr], they manifest objections to the Divine Will, in various guises, such as impatience or complaining. 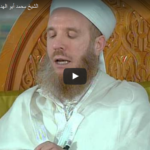 He went on to outline some spiritual solutions to complaining, after cautioning against the su adab towards Allah ta’ala that results from such a condition. Importantly, we need to take ownership of the truth that what afflicts us, is a consequence of our own doing. 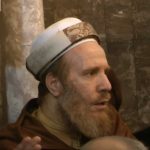 Thereafter, Shaykh Muhammad went on to talk about how many of us reduce the Deen to single aspects, rather than approach it holistically, illustrating his point using a sequence of examples, before moving on to discuss the collective challenges and contextualising their significance using a couple of historical episodes. 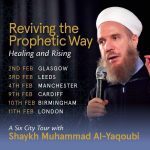 Coming back round to the spiritual states we need to aspire to, Shaykh Muhammad advised how we need to focus on changing ourselves and showing sufficient gratitude for the bounties we receive from Allah ta’ala; the latter being a crucial element that we, as an Ummah, seem to be heedless of. If one possesses the necessary knowledge and qualifications, then they should engage in presenting the Deen to others. But even if not, idling is unacceptable. Taking positive, pro-active steps to effect change is incumbent upon us all by virtue of being Muslim. Be sure to uphold the rights of others, avoid oppressing anybody, as one’s du’as will not be answered if they are guilty of this calamitous sin. Shaykh Muhammad dwelled on this a while longer, expositing how victory cannot be forthcoming when we act unjustly towards others. 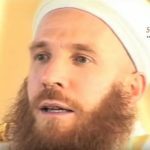 This wonderful, and important, talk, closed with an observation that if we, collectively, rid ourselves of the bad traits that are unfortunately intrinsic to so many of our day-to-day lives, the power of our supplications would be witness to miracles occurring. Something for every one of us to ponder on long and hard. 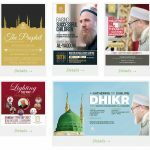 What is the status of the family of the Prophet ﷺ? What respect do we owe them in this world? 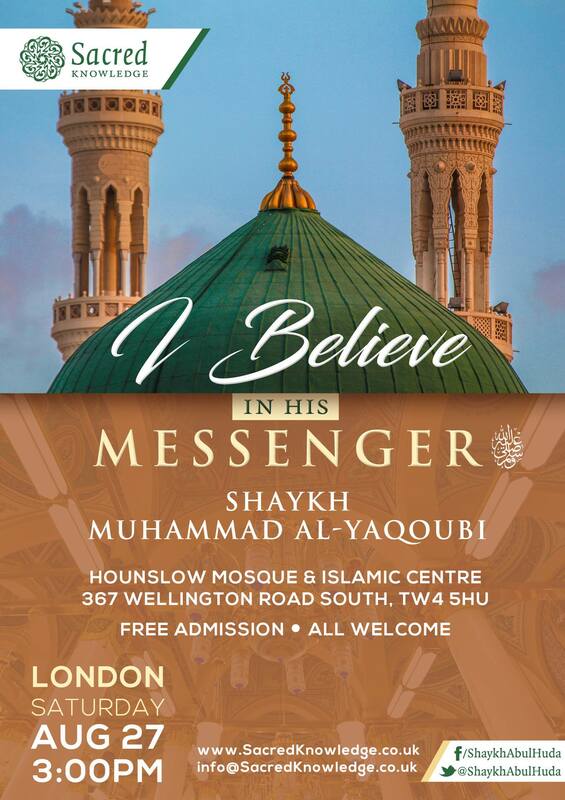 A much-neglected topic in modern times but of paramount importance to the Ahl us-Sunna: Shaykh Sayyid Muhammad Al-Yaqoubi will be talking about the Virtues of the Ahl ul-Bayt. 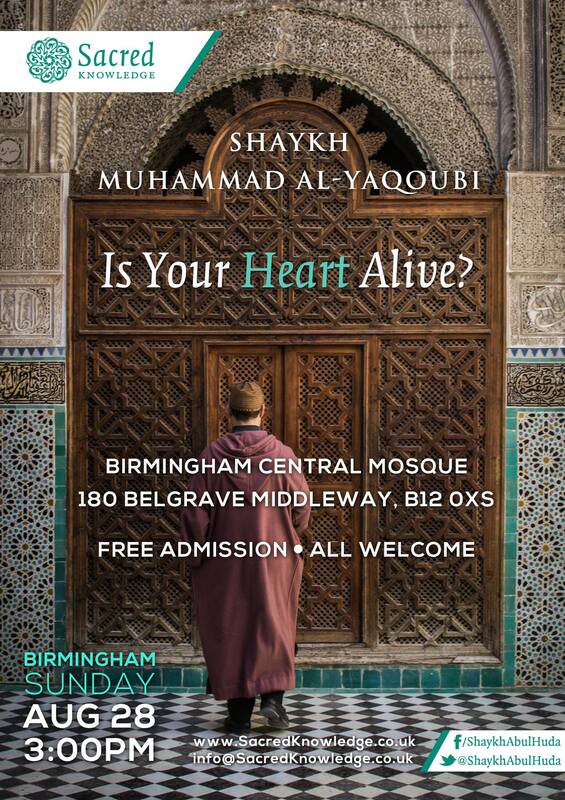 Shaykh Sayyid Muhammad Al-Yaqoubi advising us on how to keep our hearts alive with the love of Allah ﷻ and Rasulullah ﷺ.